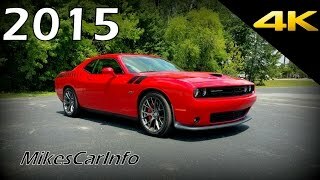 Back in 2008 Challenger marked its return of Dodge lineup and since then is appreciably coming with one or the other upgrades. Following the same sequence, for the year 2015 company presented its remarkable re-engineered Dodge Challenger SRT 2015. The model is coming with rise of 15 hp in its total output and is equipped with numerous other features. 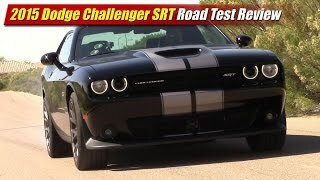 Let us have a look at the review of Dodge Challenger SRT 2015 to know about it better. The interior of Dodge Challenger SRT 2015 is loaded with world-class materials and innovative features. Moving inside first thing that you’ll notice is are the redesigned seats that offer more comfort through better cushioning and heating and ventilation (for front seats). Sitting over these comfortable inculcations you can rest your hand over the heated flat bottom steering wheel with paddle shifters at its back. Behind the wheel you have a seven inch driver information display joining the instrument cluster with gauges at both its sides. While an 8.4 inch Uconnect touchscreen is also mounted over the center stack. Moving ahead and having a look at the center console, you might find yourself attracted towards its new trapezoidal shape with aluminum trim while the surfaces come wrapped in leather with accent-stitching. 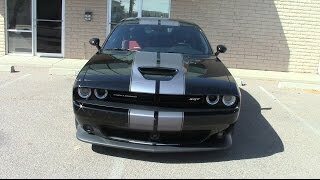 Rounding up the entire interior details of Dodge Challenger SRT 2015 we would say its classy and comfortable with its new design. The exterior of Dodge Challenger SRT 2015 borrowed some cues from its ancestors and looks aggressive with the optimum blend of luxury. Starting with the front fascia you’ll notice entirely new vertical split grille sitting at the end of Aluminum hood. While the former hold its roots in a 1996 model latter is inculcated to reduce the weight of model. Projector headlamps and fog lamps are also integrated giving a proper view and also to add to the menacing looks of the model. Beneath this entire setup is a buck-bill fascia splitter which adds to the aerodynamics of vehicle. Moving towards the rear end Dodge Challenger SRT 2015 takes cues from the 1971 model with its slit-lamp design and tall rear spoiler. Rounding up the exterior details of Dodge Challenger SRT 2015 we would say it’s an aggressive work of engineering with blend of luxury. 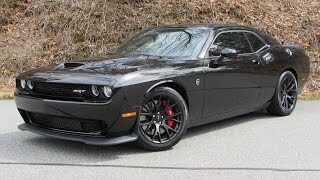 The Dodge Challenger SRT 2015 beneath its hood brings a 6.4 Liter V8 engine generating total output of 485 hp and peak torque of 644 nm paired to eight-speed automatic transmission. 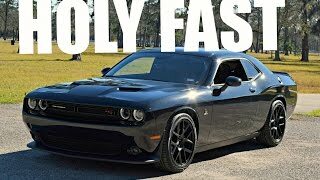 With this power throbbing through its engine the top speed of Dodge Challenger SRT 2015 reaches mark of mph providing fuel efficiency of 15 mpg/25 mpg (city/highway).